A trip to Cape Town isn’t complete without experiencing the magical African sunset at least once. Don’t feel like missing out on one of the most astonishing sights of your trip? A sunset boat cruise with a glass of champagne (or maybe a dinner) is the perfect solution for a romantic visit to the Mother City! We know how difficult it can be to pick the perfect boat cruise. There are so many to choose from. We’ve handpicked the best sunset cruises in Cape Town and reviewed them to help you make an informed decision. There is nothing like seeing Table Mountain as the sun goes down, marveling at the glorious beaches that surround the city. If you don’t want to miss out on this sunset boat cruise opportunity, compare our different tours and prices and pick the best one for you. The Tigger 2 Royale is one of the most sought after fast cruisers in the entire harbor at the V&A Waterfront. It may be small, but it oozes luxury and is definitely one of the best ways to enjoy a romantic evening with a loved one. The sunset cruise departs close to the clock tower at the Victoria & Alfred Waterfront. From there you will sail towards Clifton 4th Beach, or if the weather permits, towards Table Bay. On the way back, that’s when the real beauty of the city comes to life. You can watch the sunset over the mother city in contrast with the bright city lights. Table Mountain will without a doubt look incredible. This is a romantic adventure you definitely can’t miss. Sunset cruises can start any time from 17:00 and continue until 20:30 depending on the season. This cruise takes approximately 90 minutes. 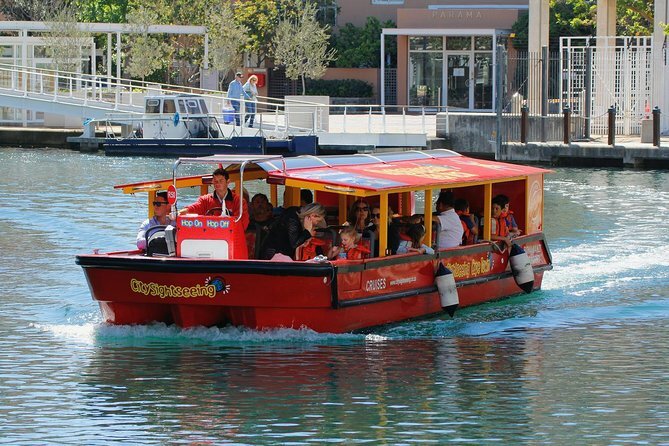 This Cape Town sunset cruise is a great way to experience the waters around the city, whether you are with family, friends, at an office party, or with a loved one. The private charter ensures a cozy and private affair. Starting and ending at the V&A Waterfront, you can spend your day exploring one of the most popular and famous spots in the whole city, have some dinner or pre-drinks, before heading to the yacht for your cruise. We also recommend an exclusive sunset yacht cruise for only one couple. This option is great for special romantic birthday celebrations or proposals. This tour is a 3 hour tour and includes a 3-course dinner and some bubbly! Monday – Sunday. Sunset Time slots will typically start an hour before sunset. 60-90 minutes. Private tours can last up to 3 hours. Do you want to enjoy the most romantic sunset champagne cruise Cape Town has to offer? This rare sunset boat cruise includes a 3-course dinner at a choice of three restaurants in the Victoria & Alfred Waterfront. Departing from the waterfront, the boat will make its way towards the Milnerton Lighthouse, sailing across Table Bay before slowly sailing back to the waterfront. You’ll get to experience the magical sunset over Table Mountain while you’re sipping on a glass of champagne. You get to enjoy your meal ashore once you arrive back at the harbour. The 3 restaurants include different varieties and menus. Italian, traditional local South African grill and Greek food. So spice things up and make sure to choose the best restaurant to enjoy your 3-course meal after watching the glorious sunset. To top off a great day of adventure and sightseeing, relaxing on a catamaran as it floats along the beautiful Cape Town coast is the ultimate way to relax. Throw in the fact that you can watch a jaw-dropping sunset, you have the makings of a very memorable night. Your cruise will start at the V&A Waterfront, where you will then sail down the Atlantic Seaboard, along with the southern coast peninsula. With the sea on one side, and Table Mountain on the other, be prepared to be mesmerized. You can also enjoy amazing views of Cape Town Stadium, and depending on the night, it could be lit up. You can also view the city lights as the sun sets. Your cruise will end where it started, back at the amazing V&A Waterfront. Taking in the beautiful sites of the city from the comfort of a yacht or a catamaran is one of the most unforgettable experiences. Pick the best sunset cruise Cape Town has to offer. Once the sun starts to set, you will be captivated by the beauty of the Mother City. Sehr schöne Fahrt in den Sonnenuntergang. Sehr zu empfehlen. It was a wonderful trip. We sailed relaxed into the sunset with some drinks and good music. The captain and the crew were like good old friends. We had a wonderful time and can really recommend this trip!